One of Nancy Glazier's favorite subjects is the monarch of the plains, the buffalo. 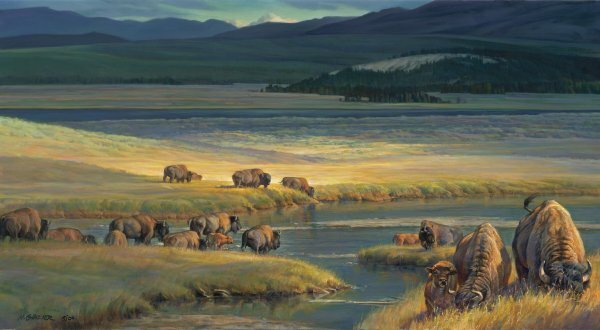 This monumental landscape of bison grazing and enjoying the refreshing water in the valley is a spectacular image as only Glazier can paint wildlife in its natural habitat. Once hunted to almost extinction, the buffalo thrive today in many areas of the country. These magnificent animals are a symbol of the old and the new West and continue to fascinate the artist.